It has been suggested that this article or section be merged into Gummi. The Kingdom model Gummi Ship. The Gummi Ship is the main method of transportation between worlds in Kingdom Hearts, Kingdom Hearts II and Kingdom Hearts III. The other games use other mechanics for transportation. Several characters, including King Mickey and Sora, as well as groups like the Heartless and the Nobodies, use Gummi Ships to move between worlds. These ships are made entirely of Gummi Blocks, made of special Gummi material that allows to travel between Worlds. Gummi Ship travel is a bit slower, but more reliable alternative to warping by using a Corridor of Darkness. Although Gummi travel seems to have originated with King Mickey, it is now mostly handled by his loyal subjects Chip and Dale, as well as Radiant Garden refugee Cid and Pinocchio's father, Geppetto. Sora, Donald, and Goofy all use the Gummi Ship to sail across the worlds. Using the most open routes possible, the trio traverse the universe in hopes of locating the King and Riku. Riku first discovers that a Corridor of Darkness works faster than any ship, but drains one's life force. After sealing the Keyhole of Hollow Bastion, Leon reveals that when the Heartless are extinguished, it will be impossible to traverse worlds anymore because the world barriers will be reconstructed. Sora, although disappointed, knows it will be for the best. It is unknown what happened to the Gummi Ship after the trio landed in the End of the World, but it presumably stays in the world until it collapses, and then falls into the void of darkness. Yen Sid magically retrieves the Gummi Ship and returns it to Sora and company when they arrive at his tower. King Mickey likely uses his Gummi Ship to travel across worlds as well. In Radiant Garden, Uncle Scrooge reveals how the Gummi Ships were made. This time around, the gang have to unlock Gates in order to make it across worlds before Heartless appear there. Once again, it is unknown what happened to the Gummi Ship when The World That Never Was fell apart, but it is likely that it was recovered and used for Mickey to report to Yen Sid about the location of Ventus's heart later on. Mickey, Donald and Goofy use the Gummi Ship to travel from the Mysterious Tower to Disney Castle to confront Maleficent, and likely use it to return. In order for Sora to regain the powers he lost when Xehanort kidnapped his body, Yen Sid directs Sora and his friends to go seek training from Hercules at the Coliseum. On board the Gummi Ship, Sora initially has trouble finding a route, but at Goofy's urging, takes Yen Sid's words to heart and uses his heart as his "guiding key", opening a Gate to the world. Sora, Donald, and Goofy often sit in the cockpit of the Gummi Ship as they decide what to do next and keep up with Riku, Mickey, and Ienzo on the Gummiphone. After Xehanort's defeat, Riku uses the Gummi Ship to pick up Naminé at Radiant Garden, and Roxas, Xion, Hayner, Pence, Olette, Isa, and Lea at Twilight Town, and brings them all to the Destiny Islands for a party. In the Gummi Garage, the player can create their own Gummi Ship from the Gummi Blocks they possess. The player can create any design of ship they desire, so long as it uses no more than a set number of blocks, but blueprints with pre-made designs can also be obtained through various means. Gummi Blocks can be obtained by purchasing them in shops, finding them in treasure chests, or looting them from destroyed enemy ships. However, Sora will receive a full set of Gummi Blocks for retrieving all 99 Puppies, so that no further purchases or looting is necessary. In order to reach other worlds, the player must fly along the route between the worlds each time until they obtain the Warp-G that lets them teleport directly to that world. When flying along routes, Gummi Ships fly forward on their own through dense, generic asteroid fields, with the player controlling the ship's position on the screen—up, down, left and right. The player can also hit the brakes, slowing the ship down. Meanwhile, enemy Gummi Ships piloted by Heartless fly through the expanse, infrequently harrying the Gummi Ship or sometimes simply blocking its way. When the obstacles are destroyed by weapons fire, they will drop pick-ups that refill the Gummi Ship's Armor or Power. When enemy ships are destroyed, they will randomly drop Gummi Blocks or the ship's blueprint. Certain routes also contain wormholes (called Warp Holes in-game) that detour to other routes, or the gigantic whale Monstro, who will swallow the ship and force it to land within him. While certain special blocks and blueprints can be obtained by arriving at each world under a certain criteria in the Final Mix version of the game, no points are awarded for flying Gummi routes, and in general the only purpose of flying one is to get from point A to point B.
Armor: The ship's Hit Points. Power: The ship's Magic Points. Shield: Extra defense for the ship which can only be obtained from the Shield blocks. Turbo: Extra speed for the ship which can only be obtained from Haste blocks. The Gummi Ship system in Kingdom Hearts II is much more coherent as a full-formed mini-game, but is also compact and mostly separated from the main game. Gummi Ships are constructed much the same as in Kingdom Hearts, but Gummis that provide special effects, such as weapons or engines, take up a parallel space to generic material gummis, and therefore can be embedded within them. More complex designs can also be applied to each block, instead of just flat colors. Gummi Ships can also equip a certain number of abilities that grant certain boons to the ship, such as automatically drawing in dropped items or making the weapons more powerful. In addition, the Gummi Ship can be partnered with up to two "Teeny Ships", much tinier ships that fly in formation around the main Gummi Ship. As in the first game, the player can create Gummi Ships in any design they wish, but new blueprints are only awarded as part of specific Gummi Missions. Flying along routes is much different as well. The player must only complete the simplest version of a Gummi Mission to get to a new world, and can then warp straight to that world afterward. The routes close again after the battle at Hollow Bastion, but can be unlocked once again. Each Gummi route is also much more energetic—each route has a coherent theme, such as floating islands, ancient ruins, or a fleet of battle cruisers, and enemy ships fly in complex formations aggressively attacking the Gummi Ship. Rather than flying regular ships that the player can obtain for themselves, enemy ships are actual Heartless or Nobody species, and instead of dropping Gummi Blocks or Blueprints, enemy ships only drop Medals used for scoring the mission and items that regenerate the ship's health. The main change to flying Gummi routes, however, is that they operate as scored mini-games. The first level of a Gummi route ranks the player on how many Medals they acquire, the second level ranks them on how many enemy ships they destroy, and the third level ranks them on how many flat points they acquire. Unlike in the first game, third level missions allow the ship to also pivot to the side or backwards, although the ship continues flying along the route. In the Final Mix version of the game, each level also has an "EX" challenge that requires the Gummi Ship used to be built to specific criteria. Gummi Blocks, blueprints, and abilities are only obtained, once each, by defeating certain enemies along certain routes, or by reaching certain scores during a Gummi Mission. HP: The ship's hit points, similar to Armor. Offense: The amount of weaponry on a ship. Power: How much damage each piece of weaponry hits for. Mobility: Allows faster and freer turns and spins for the ship. Speed: How fast the ship moves through the course. A Gummi Ship being altered in the Kingdom Hearts Gummi Garage. Gummi Ships can be modified and customized extensively through the use of additional Gummi Blocks. Many of the most rare and powerful blocks must be won or found through the course of the game. In Kingdom Hearts, Gummi Blocks were frequently rewards from chests, but in Kingdom Hearts II, they can only be won through completing Gummi Missions. In addition, Kingdom Hearts II allowed players to create special "helper ships" called Teeny Ships. The Gummi Ship Editor in Kingdom Hearts II. Gummi Ships, like most ships in classic space-faring games, use lasers to exterminate enemies. A ship can use anything from small head guns to Energy Cannons on the back of the ship. In the first game, Thunder blasters were used to damage enemies; in addition, weapons named after powerful spells from the Final Fantasy franchise fired lasers with homing capabilities. In Kingdom Hearts II new weapon types were added. Blasters now came in three types—Fire, Blizzard and Gravity, while Thunder Gummis were now lasers. 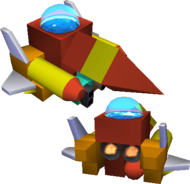 In addition to cannons and lasers similar to those from the first game, a ship could be equipped with two new types, Slash and Impact Gummis. The former fill a special gauge as enemies are defeated, and when full, the Gummi unleashes a powerful, devastating attack. The latter deals damage when enemy ships collide with the player's. The Gummi Ship Workshop at Disney Castle. Cid and Mickey's Gummi Ships have not yet been seen, although there is a blueprint titled "Cid" that is obtained from Geppetto in Kingdom Hearts. It is unknown if this is actually Cid's ship, however, as blueprints also appear for Leon, Yuffie, and Aerith. In the first game, the name of Sora's Gummi Ship is either the default Highwind, Excalibur, or the name players choose for the raft. However, the ship model is called the Kingdom model in Kingdom Hearts II. The name Kingdom only appeared as the name of the blueprint for the default Gummi Ship in Kingdom Hearts. This page was last edited on 3 April 2019, at 17:35.